**My Desert Cottage**: Pictures looking a little dark these days??? Hello everyone. I'm sorry I don't have anything creative or crafty to share with you today, but I do have some valuable information. Many of you with blogs may have noticed that your photos or the backgrounds you are loading to your blog are coming out darker than they should. This is due to Google's very annoying habit of changing things and not telling anyone what they are doing!!! Since Google+ became a part of our Google account (whether we like it or not and whether you are using the Blogger profile on your blog or not) they have added a new feature to all our accounts. It is called Auto-Enhance and it has been turned on by default for all Blogger blogs. Apparently, it does not always effect every single image. Only the ones it's tiny little brain deems necessary for enhancement. For me and my blog design business, this had become a real pain because all the backgrounds I was loading for clients were turning colors and were not loading as they were intended. Luckily after some research I was able to discover the problem and now have to turn off this feature for all my clients. If you are having this issue and don't like what it is doing to your photos or the backgrounds you are adding, here is how to fix it. First go your dashboard and click on the down arrow next to your name in the upper right corner. 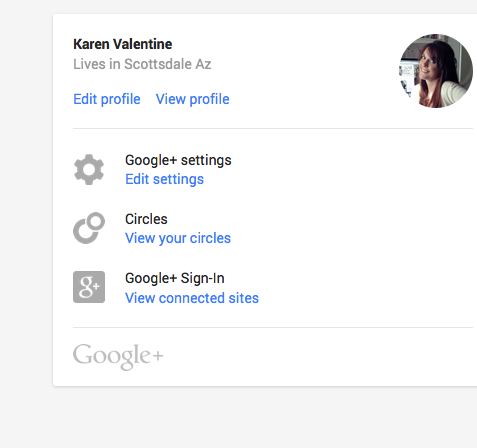 You will see Google+ Settings . Click Edit settings. Scroll down until you find the Photos and Videos section. You will see Auto Enhance. Click Off and you are done! No more dark "enhanced" photos!!! I hope you found this info helpful. I hope to be back doing more creative things soon. Right now all my time is being spent getting ready for my class this Spring for Kim Caldwell's event, An Affair at Downton!! Can't believe Google keep "improving" things by making them worse! Thank you for the info... though when I followed your instructions, I was offered the opportunity to upgrade to Google+, so I don't think I'm under threat yet... and no intention of upgrading at this rate, either. They'll force me to be all one identity - and I'm already furious enough about the email address I've been unalterably landed with at gmail! This was driving me crazy a couple of months ago until my daughter figured it out for me! I know this is going to be a big relief to many people to have the "fix" spelled out for them. Thanks for sharing the helpful info! I really hadn't noticed Karen but I did it anyhow...Mine was set on Normal..Thanks for the info...Very helpful as always.. Thanks Karen, I changed it! You are always there to help! Thank you! I appreciate that you let people like me (I need all the help I can get!) know about these things! Thank You Karen, You are so helpful when we need it. I am in the process of changing computers which has sure been a challenge. Other then not having some of my pictures. I am progressing. Thank you for all of your help. Hugs and Prayers from Your Missouri Friend. Thanks so much Karen! Appreciate you! Thank you for all the wonderful blog hints you give. These are things that I would never figure out for myself. I haven't signed up for Google+ but had a weird thing happen with a photo I was uploading for my Christmas banner, which had a white background. It was gray until I turned it from a jpg into a png image, then it worked fine.... I was just trying anything I could think of, and frustrated! Thanks for the info Karen.... and how I would LOVE to come to the affair at Downton!!! Good heavens, the things that go on behind the scenes. I'm going to have a look at this, not sure if you've turned it off already for me. Thank you for the helpful tip, Karen. I wouldn't have known what to do about that. LOL!!! And I have not been very good at that. But, I did finally get a post up. Thanks for stopping by. I'm trying to return to normal life but, with this mess it's hard! Romeo asks Google, "REAllY? Was this necessary??!? If it isn't a mouse, leave it alone! Purrlease." Thanks for showing "her" how to fix it! You are our hero! Purrs to you. Hiss hiss to Google. SWEET, I just changed mine, thank you so much sweet lady!! YOU are the BEST. Thank you sooo much for always having the answer - Google should have you on their payroll!! Thanks so much for your helpful directions. You are a treasure. Whattt?? I had this happen and couldn't imagine what would be causing it!! You're amazing! Thanks so much for the tip! Since I post things I sell on my blog from time to time, I want them to look the way they look when I edit them! Hope your new year is off to a great start! I am going to email you re: my blog, and a couple things I'd like you to do for me! Thank you Karen. I haven't noticed it yet but know I will know what to do if it happens. Thank you so very much! Your post is greatly appreciated as I am a low tech blogger; all help is more than appreciated. Thanks for sharing this, Karen. Much appreciated! Linking this post on my blog now, thanks so much for sharing this! That was driving me crazy!